This weekend, whilst bored in Camden, me and Heather decided to go to London Zoo. Compared to previous times where I’ve been for free because Dad worked in the garage over the road, and fixed someones car, this time I got free entry by making a charitable donation of £28. Now it’s the first time I’ve seen this happen, but I’m guessing other attractions are doing this too or will be soon. As by making a donation, instead of purchasing an entrance, the zoo are able to claim Gift Aid, which means the Inland Revenue give them £7.84 of the income tax I’ve already paid. Well I got the Haloscan email, so this test of one post quite clearly proves nothing is wrong. 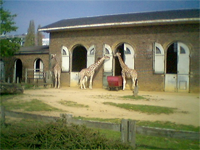 Yes, the London zoo is quite nice. I’m commenting! Because you said on the Haloscan forums nobody had, and also because your avatar is from Yoho Ahoy, my favourite kids’ show ever.